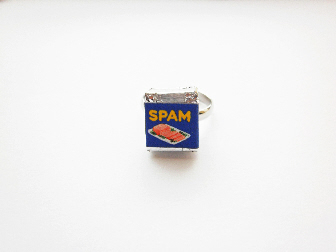 Unique Spam Ham Tin miniature ring. Famous ham which was eaten in 1930's Britain is now available in ring form. Handmade with an antique appearance. Ham tin is 12mm and crafted from metal with real foil covering the top. Fully adjustable silver plated ring. * Due to the handmade design of this item styles will vary.